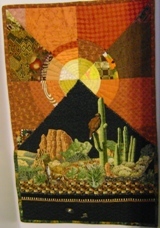 Nancy Lindberg’s quilts, usually composed of strong colors, are whimsical, sparkly, surprising. and beautifully crafted. A look around the walls of her sewing room quickly acquaints a visitor with her imaginative artistry. 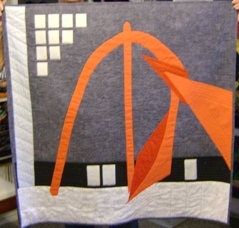 Her quilt, “Flamingo in the City,” a quilted rendition of Chicago’s Daley Plaza Picasso sculpture, awaits hanging at the quilt show at Rosemont this year. Another glowing work showcases a fractured moon over mountain peaks alive with beadwork. Lizards roam cheerfully on a third fanciful piece that invites a closer look. Growing up in Naperville where her father owned Van Ham Shoes, Nancy first learned to love fabrics from her mother, who was an excellent seamstress, and from her grandmother, an accomplished quilter. It was a natural move from that start to becoming a home economics teacher at Washington Junior High School in Naperville, a position from which she is now retired. ​She began quilting after she retired while living in Stockton California, where a friend persuaded her to join the River City Quilters’ Guild in Sacramento. Later she spent some time in Catonsville, Maryland, where she was president of Village Quilters and also headed up their special events program. Since joining RQG in 1997, she has served in hospitality and also as the chair of RQG’s newest opportunity quilt.